Have I mentioned that my kids love eating bell peppers? I got these peppers out of the fridge to use in the soup and the little pepper-munchers wanted me to cut them up so they could eat them right away. 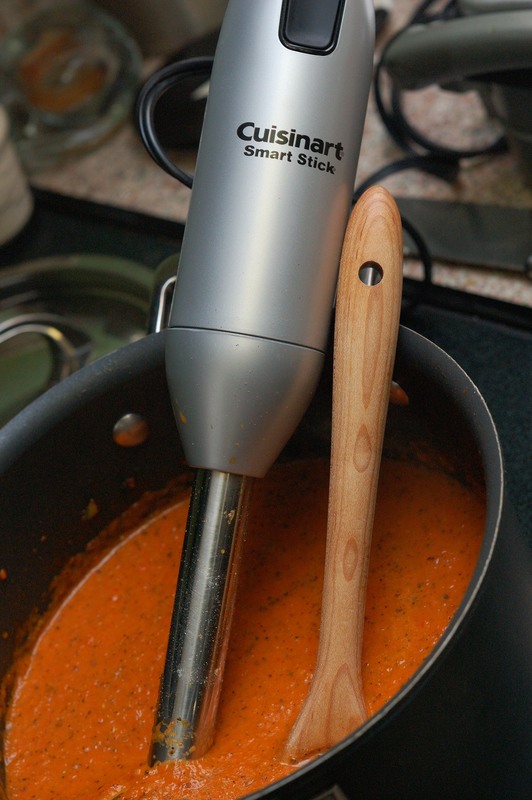 This past summer, when garden fresh tomatoes, red peppers and herbs were plentiful, I tried a recipe for garden fresh tomato basil soup from Will Cook for Friends. It was wonderful! I made it several times and made a few changes, adding more red pepper and using chicken broth in place of water. With garden fresh tomatoes months away, I wanted to try a winter version of this favorite soup of ours. 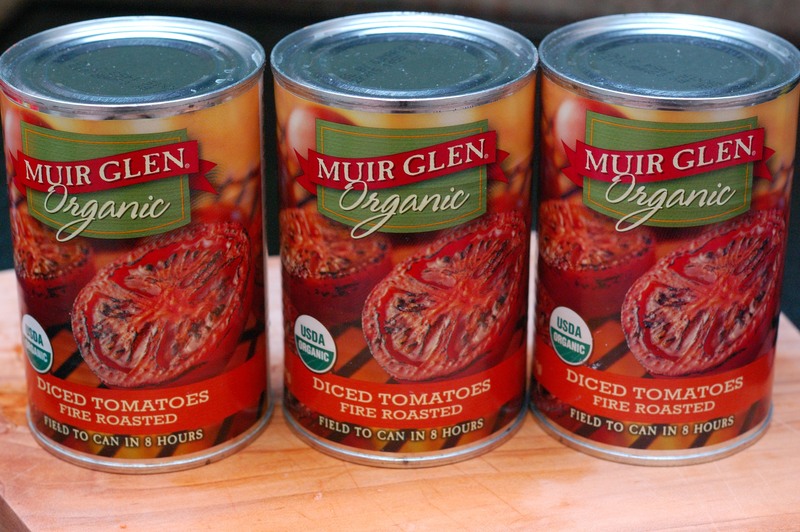 Instead of fresh tomatoes, I tried canned fire roasted tomatoes from Costco. 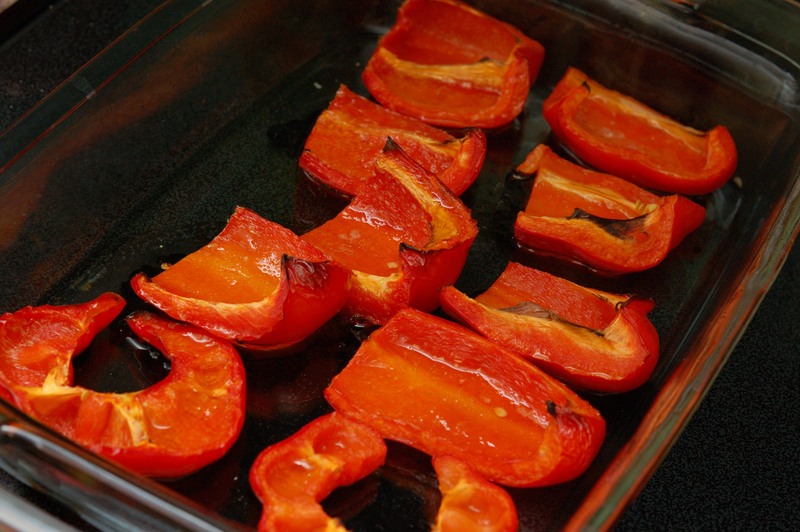 I cut up two really big red peppers, drizzled a bit of olive oil on them and roasted them in the oven at 400 degrees for about 45 minutes. I added them to three minced cloves of garlic and half of a chopped up white onion that I had sauteed in olive oil. Then, I added two cans of the tomatoes, one and a half tablespoons of dried oregano, three tablespoons of dried basil, a pinch of sugar, a tablespoon of balsamic vinegar and a cup of chicken broth. I blended it all with my handy immersion blender and added some salt and pepper to taste. 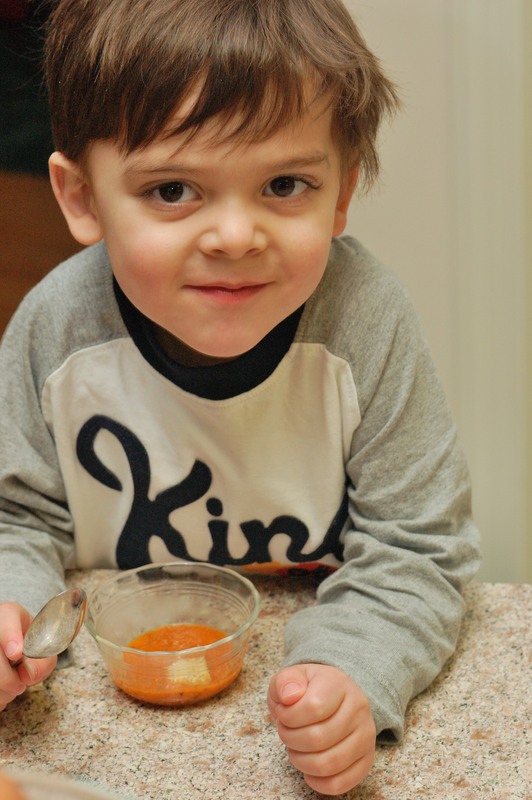 Theo was curious about the noise from the blender and was the first to come try some soup. He wanted a few croutons in his. I called in the girls, who were busy pretending to be super-hero-best-friend-sisters. Super hero #1 was not happy to have her super hero activities interrupted. She gave two thumbs down, but did offer to eat the rest of the soup in her bowl in exchange for croutons. 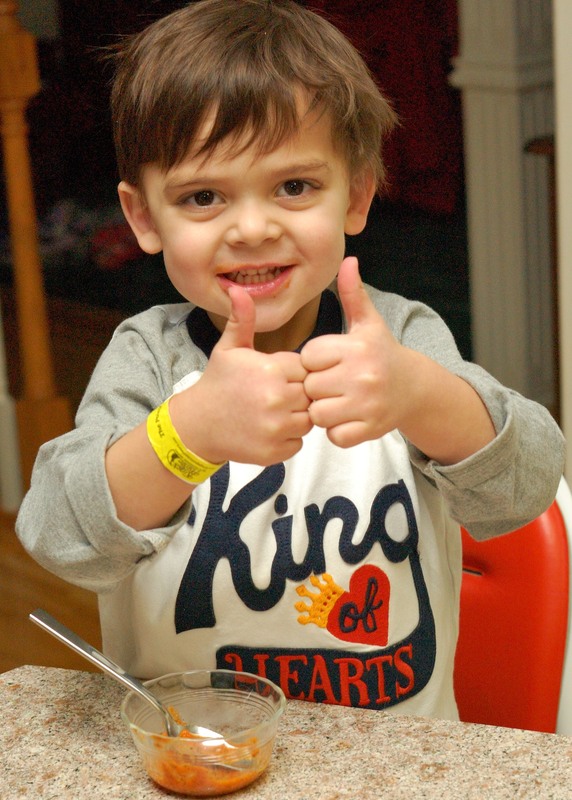 Super hero #2 was happier to taste the soup. 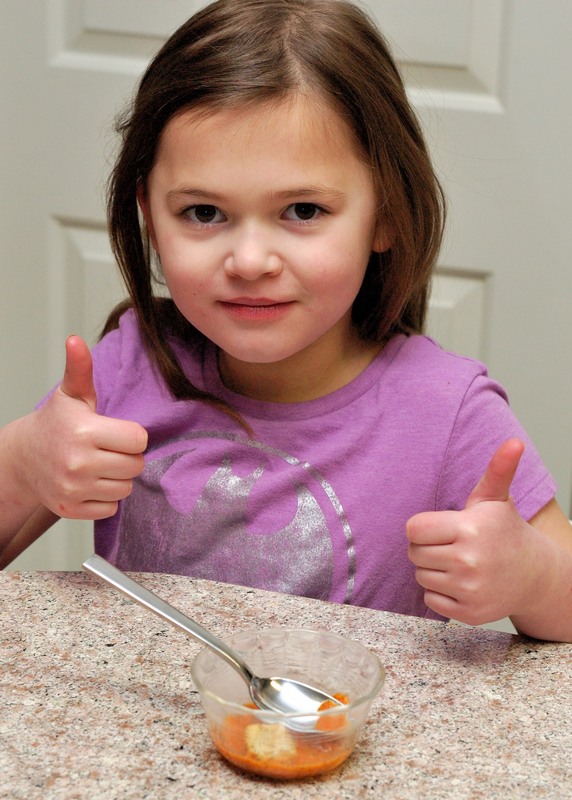 She requested goat cheese and crouton topping and happily ate it, giving a two thumbs up rating. Dave and I were both pleasantly surprised with how much we liked this version of the soup. We were afraid that using canned tomatoes and dried herbs would ruin it, but we found that using the canned fire roasted tomatoes gave it a nice flavor. 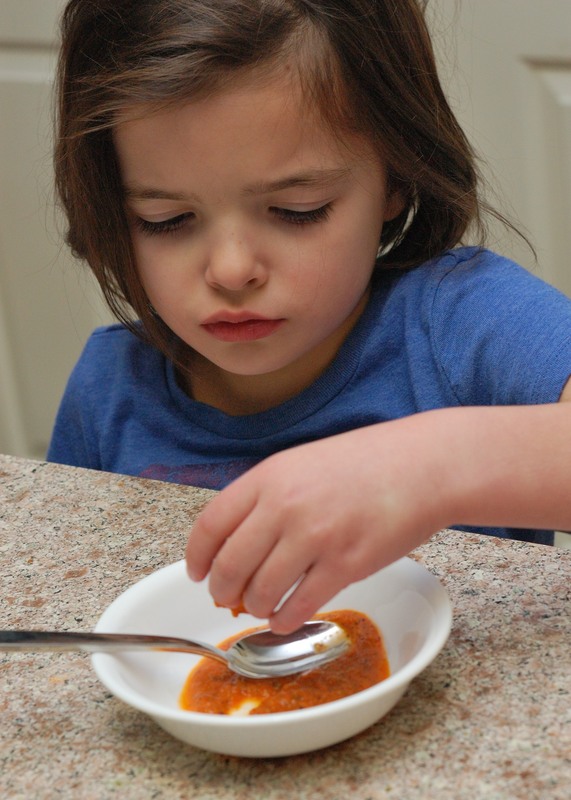 I love the roasted red pepper in this soup. If the peppers I used hadn’t been huge, I might have even added one more. 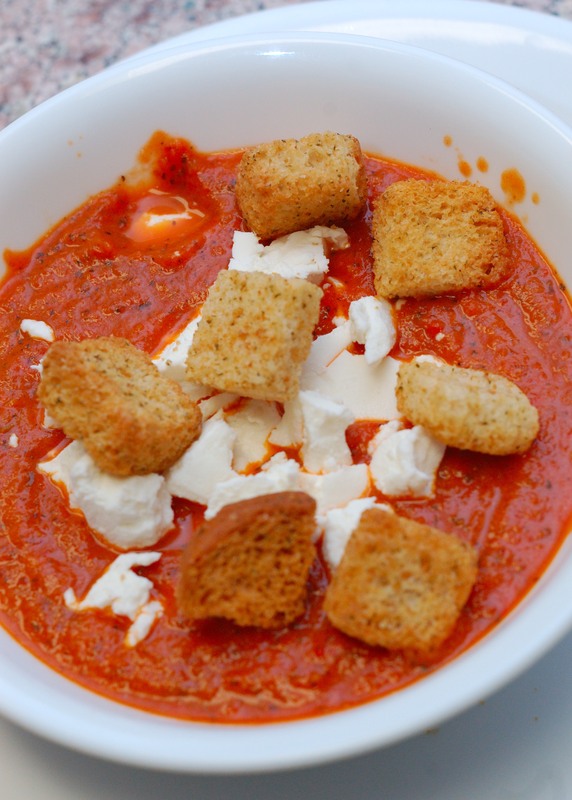 We also love our tomato soup with goat cheese and croutons. Preheat oven to 400 degrees. 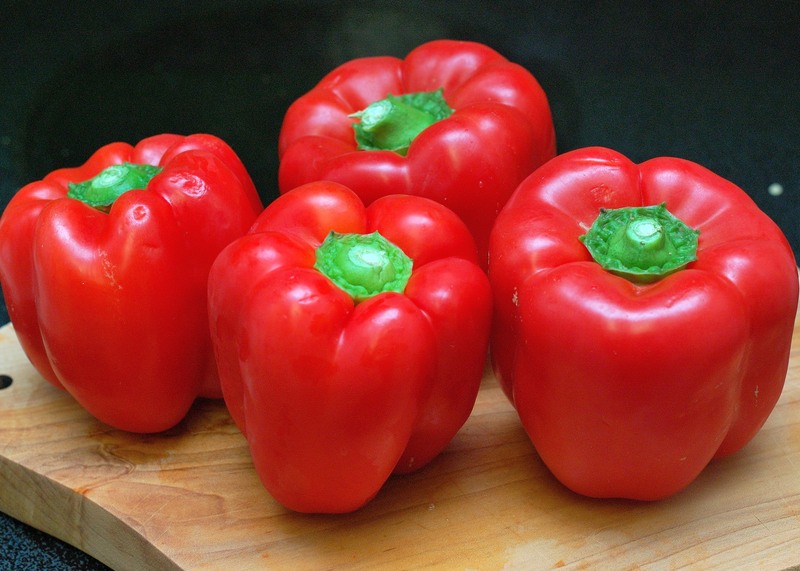 Quarter and remove seeds from bell peppers. Drizzle with 2 tbsp. olive oil and bake in a baking dish at 400 degrees for about 45 minutes to roast. 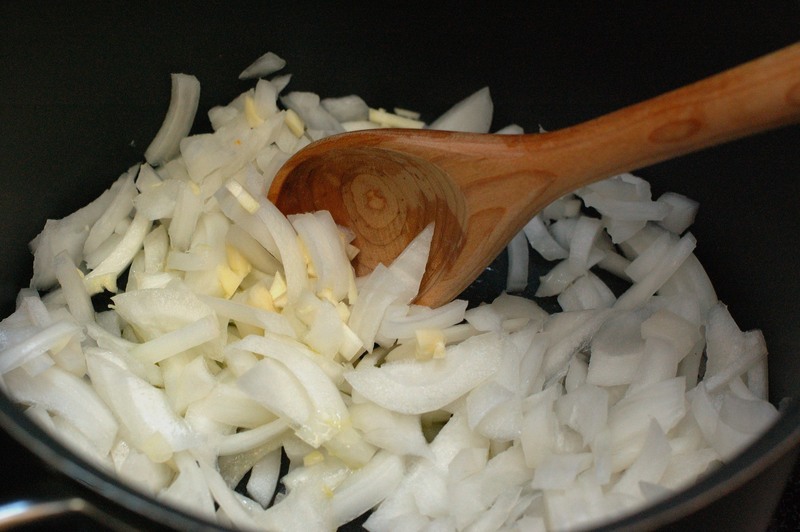 Saute onion and garlic in 2 tbsp. olive oil over medium-high heat in a medium soup pot. Add the tomatoes and roasted red peppers to the garlic and onions. Add the chicken broth, basil, oregano, balsamic vinegar, and sugar. Simmer for a few minutes before using the immersion blender . Make it as chunky or smooth as you like. Add salt and pepper to taste. Add more chicken broth if you think it is too thick. Garnish with plenty of goat cheese and croutons. Enjoy! I love this soup, especially with goat cheese. I thought it was even better than the soup we made this summer and I would have eaten even more if I had been hungrier. Categories: Bell Pepper | Tags: basil, fire roasted tomato, oregano, red bell pepper, soup, vegetable | Permalink.